Guay Inc. specializes in operated and non-operated crane rental, handling and transportation, and has the largest fleet of cranes in Canada. This consists of more than 550 mobile cranes, crawler cranes or tower cranes, as well as trucks, flatbeds and trailers. It is one of the largest companies in North America. Guay Inc. has also acquired the LARGEST ALL-TERRAIN HYDRAULIC CRANE IN THE WORLD, which has a 1500-ton capacity, and has many other high-capacity cranes, such as 600 and 650-ton all-terrain cranes as well as 700-ton crawler cranes (see photos and video below). Guay is the only company in Quebec to have cranes this big. These cranes are used to lift enormous parts in complex conditions. 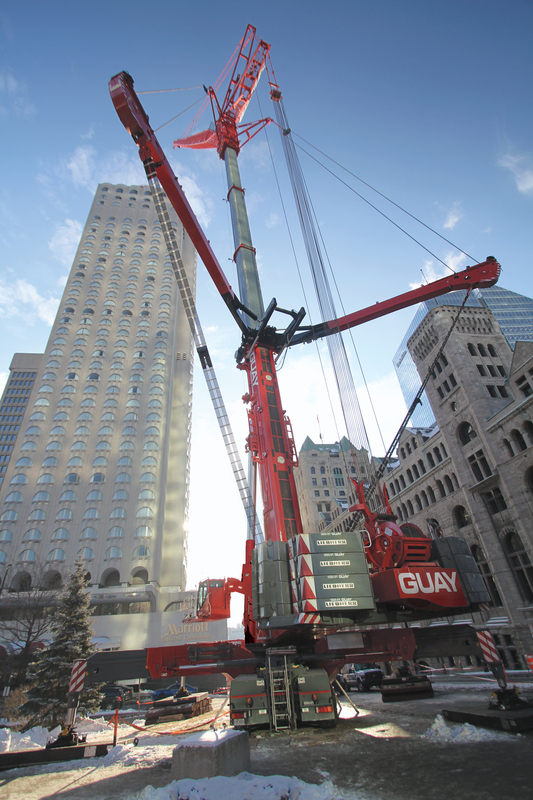 Guay has 24 locations throughout Quebec, including a fleet of 160 cranes in greater Montréal as well as a fleet of 25 tower cranes; it employs more than 500 people, including a team of nearly 100 professionals and administrative employees (engineers, technicians, representatives, dispatchers, buyers and administrative personnel), a qualified workforce of more than 350 crane operators and more than 80 truck drivers, mechanics and labourers in every category. We would be proud to bring our skills and experience to help you complete your lifting, transportation and handling projects. Whether it’s to do work at extreme heights or other dangerous kinds of work, Guay Inc. can help you complete your most ambitious projects. To provide operated and non-operated crane rental services, transportation and handling services and related services to handle any kind of work, primarily in the province of Québec. Pride is reflected in the satisfaction of a job well done everyday. It is also reflected in a sense of belonging to a company that shows us the same level of confidence we have in it. Pride also means recognizing the company and appreciating its value. Employees identify with the company name and show their pride by properly maintaining our equipment. Our integrity always dictates our actions, our work and our policies. This integrity remains intact regardless of the internal or external pressures that may influence it. Strict rules of ethics and conduct are rigorously applied in all situations. Team spirit refers to the collaboration, cooperation and support among our employees, not limited to sharing each other’s tasks and responsibilities. 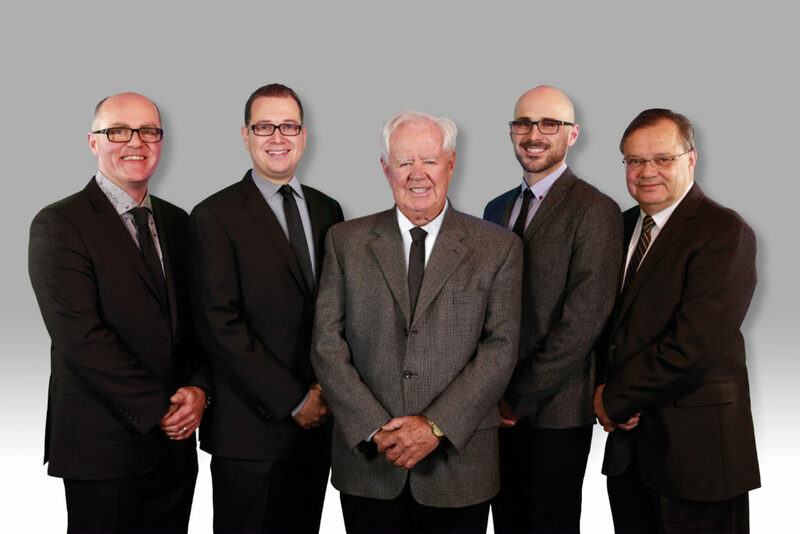 Sharing our ideas, our efforts and our talents fosters everyone’s success as well as the organization’s, all in a family atmosphere where working together is enjoyable. Respect means to fully consider all the individuals who contribute to the company’s mission. It also means treating our customers, suppliers and colleagues as we wish to be treated. We treat others as equals. Health and safety is the company’s top priority and it must be integrated into all aspects of our work. Health and safety is everyone’s responsibility. The company must take every measure to ensure its employees, customers and suppliers work in a safe environment. In return, each employee must contribute by acting and behaving responsibly. founder and President. Mr. Baronet is supported by Guillaume Gagnon, Vice President, Michel Riverin, Director of Operations and Labour Relations, Frédéric Parent, Director of Finances and Administration and Jocelyn Têtu, Executive Conselor. From left to right: Michel Riverin, Guillaume Gagnon, Jean-Marc Baronet, Frédéric Parent and Jocelyn Têtu. Guay Inc. is a responsible company and is conscientious about the impact of its choices on the future. This is why we pay particular attention to the environment, both in our facilities and while we carry out our operations. Inside our facilities, we aim to reduce waste by facilitating and encouraging the recycling of materials, using recycled materials and using energy wisely. In addition to equipping all of our equipment with spill tanks to contain used oil in case of an incident, we perform regular preventative maintenance to reduce breakdowns that could have an impact on the environment. We believe in sustainable development and we do our part by using biodegradable oils in most of our equipment, which minimizes the environmental impact in case of an accidental spill. We also have agreements with specialized companies in order to respond quickly in case of spills in order to recover the oils and liquid and to dispose of them according to applicable laws and standards. Our technical team, representatives and operators work in collaboration with our customers to determine the best methods, from the original design of the crane’s working area and until the work is done. 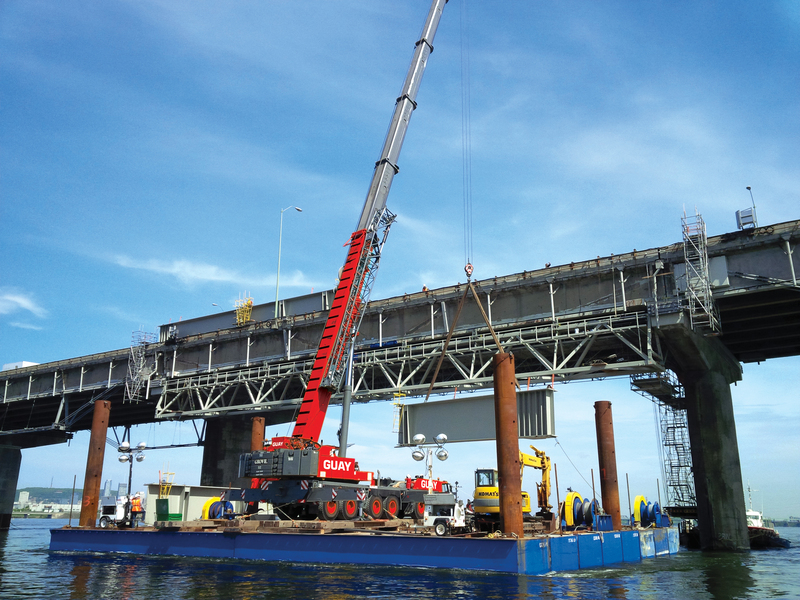 Guay Inc.’s expertise and our large selection of equipment and accessories enable us to undertake any project. We have implemented the tools necessary to complete them while protecting the environment. For everyone at Guay Inc., respecting our values is paramount and health and safety is our most important value. This value guides our choices and actions. Guay is a leader in its field and has played a major role in terms of health and safety standards. We believe that the future is built on solid foundations, and we helped to launch the Crane Operators School [TB1] as well as made a financial contribution to develop an electronic safety system for cranes, created by engineers from the Rayco and now sold all over the world. We have a Health and Safety Committee, overseen by the Executive Committee, whose mandate is to define and implement the company’s main health and safety guidelines, to share best practices with our network of locations, to identify the risks in our operations and to minimize their impacts, to analyze any incidents/accidents and to implement the necessary corrective measures. It is extremely important to us that all work projects are carried out safely. In addition to benefiting from trained and experienced operators, Guay Inc. has also equipped all its equipment with range limitation systems to help avoid obstacles like power lines, as well as with devices to prevent lifting any weight greater than the equipment’s capacity. Safety also comes from having reliable, well-maintained equipment. Our mechanical team ensures that the lifting equipment and accessories meet the highest industry standards at all times. In addition, our crane operators inspect the equipment at every use, we perform periodic maintenance on our cranes, and an engineer inspects the equipment annually in compliance with the ACNOR Z-150 standard, applicable to mobile cranes. As the company’s motto says: “Safety, we believe in it,” every necessary effort is invested in order to achieve our objective: NO INCIDENTS.